We’ve migrated to github sites powered by Jekyll. Now to spruce things up a bit. On the last day of camp, we had a special visitor from the University of Texas at Dallas: Farah Ellenbogen. We sat down with her and spoke about the camp, our mission and our efforts. In turn, she wrote a great article about us for the UTD LINK. It talks a bit about our history and how we went about constructing the camp. Thanks again to UT Dallas for their continuous support. Thanks Farah! Meagan Dahl (left) describes the benefits of an open source community. Julie Strickland (right) emphasizes the importance of “getting a second opinion.” The girls are doing a great job both designing and building their very own LilyPad Arduino projects. This morning, Mark is introducing us to electrical circuits and showing us how to create electronic schematics. Julie’s going to help the group understand mechanical diagrams by drawing examples on the wall. Both electrical and mechanical diagrams are helpful when planning any kind of project involving electronics. After hearing from both sides, each girl is drawing her very own electrical schematic and mechanical layout as they prepare to build their first LilyPad Arduino project. The girls are developing an understanding of the concepts around coding in the Arduino IDE. Volunteers, Toni and Amy, are going to walk through the basic setup() and loop() functions necessary to compile the program then go into more advanced concepts like conditional statements and instantiation. Thank you to the University of Texas at Dallas, Emerging Media & Communications Program for the use of their computers for the duration of the camp. Then comes the interactive part of the day where the girls are able to start programming and lead bending. Girls will seperate into small groups to prepare their resistors and LED’s by delicately curling each lead using pliers. By coding in the Arduino Integrated Development Environment (IDE), coders are able to tell the LilyPad Arduino exactly what to do: blink, fade, or create a Persistence of Vision (POV) message. They are then able to alter the message text by changing the value of the text array. Each purse and bracelet will be truly unique: some are large, some are small; some are curved, some are rectangles. The girls are also going to begin sewing their purses today. It’s exciting to see the projects come to life! And what do our campers think about all this? Let’s just say they are hugely enthusiastic. Julie offered up some quick feedback she collected from the ladies attending. Camper #1: “Awesome! I loved it.” Camper #2: “Good. I like camp. My one problem was that I had to recode it twice.” Camper #3: “It was awesome! Except it was hard!” Camper #4: “It was confusing, but we figured it out. It was great, that we got to put into practice what we learned yesterday.” And the whole table answered, “Yes” in unison! What do these things have in common: fashion design, microcontrollers, LED’s, and fun? They are all part of the first day of this year’s Electronic Fashion Camp for Girls! Today the girls are taking a crash course in all things LilyPad Arduino. We’re talking programming, electronics, circuit boards, rapid prototyping, sewing, materials, and fashion. To kick off the camp, we’re going to get to know each other by working in teams to complete the Fashion Designer Challenge. Their mission: pick one model and work together to create one fashion design using only tissue paper, crepe paper, decorative duct tape, twist ties, and ribbon. The four teams will develop completely different designer creations: two dresses, one shirt, and one super hero outfit. They are all fabulous! We’ll then walk through the basics of the LilyPad Arduino, a sewable microcontroller that can be connected to fabric using conductive thread. Toni will teach us how circuits work and basic coding skills. (P=I*V kind of stuff) While coding for the first time can be intimidating, Toni is doing an amazing job of breaking it down into simple, easy-to-understand instructions. We’re teaching the girls to code for both analog (1024 settings) and digital (either on or off) settings. When talking about anything fashion related, it’s always good to have an understanding of how fashion works. Kim is helping the girls by speaking about fashion as communication. She’s a professor in Emerging Media & Communications program at The University of Texas at Dallas and runs an independent study called Fashioning Circuits. In a totally interactive session, we’re discussing what fashion and emerging media means. What do your clothes say about you? Electronic Fashion Camp For Girls - This Week! We are so excited that our very first Electronic Fashion Camp For Girls is right around the corner. The Etiquette Creative planning team is meeting up today to discuss some very important last-minute details. We are going today to pick out material and a few special ladies on the team are staying up late to sew a few Lilypads and LED’s (light emitting diodes) into amazing projects to show at the camp. We are lucky enough to get not one but three ladies to travel all the way from SparkFun Electronics in Boulder, Colorado. They are the eTextiles Expert, Dia, Arduino Programmer, Toni, and Education Department Representative, Mandi. Ladies, thank you so much for joining our fun! The volunteers of Etiquette Creative come from a very diverse range of backgrounds. We have engineers from Raytheon and media experts from The University of Texas at Dallas. We even have a high school student from Austin, TX joining in on the fun. We’ll provide a complete list with a big Texas “Thank you” after the event. 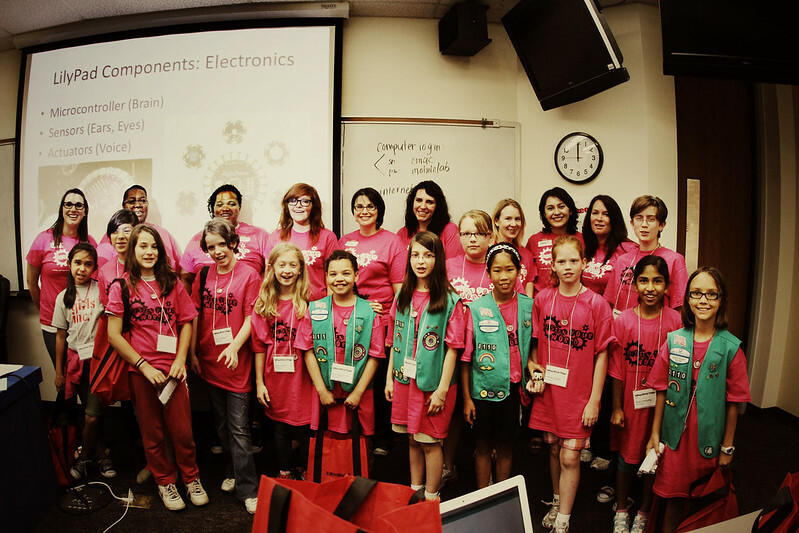 The goal of the camp is to get girls excited about Science, Technology, Engineering, Arts and Math (STEAM). Some of us prefer to say that we’re going to play with blinky lights on purses and wrist bands; that’s just as accurate and sounds a whole lot more fun! Let us know if you have questions or need more information. We look forward to seeing you soon! Having friends is awesome. Our friend Will over at QRt.co created a really neat custom QR code for Etiquette Creative. Thanks! How smart are your clothes? “Smart Fabrics” refer to cloth with conductive fibers that act like wires, transmitting power or signals. Sound like science fiction? Katy Perry wore a dress with integral LEDs to the Metropolitan Costume Ball in 2010. Ford created car seats that can measure heart rate while Toyota prototyped steering wheels with integral sensors. “A Silicon Valley start-up, Bam Labs, devised a health-care monitor that does its work unobtrusively from beneath the patient’s mattress-no wires needed. A thin inflatable pad contains motion sensors that are acute enough to pick up heartbeats and breathing patterns, not to mention the movements that signal sleeplessness or leaving the bed… The sensors wirelessly transmit the readings to a nearby networking device, which forwards them to cloud-based serves; from there, caregivers can get the information on smartphones or computers.” The Wall Street Journal, Your Mattress is Watching, November 12-13, 2011. For further evidence that people want to monitor their vital signs, look at the number of apps and equipment for sale that are dedicated to measuring the body: exercise monitors, heart rate, stress measurement, etc. Most weekends, the planning team meets up for brunch to discuss the upcoming Electronic Fashion Camp and enjoy some quality food and friend time. Some extraordinary women are stepping up as leaders and we want give them props for their efforts. Keep an eye out and you might see us around. We meet Saturdays at noon and randomly during the week; if you want to join, let us know. We visited Oil & Cotton last Saturday and it seems like a great space for what we are trying to accomplish. Mary, one of our design leads, took some quick pictures of the room we plan to use for the camp. The space has a great feel to it. Oil & Cotton is a non-profit founded by instructors Shannon Driscoll and Kayli House Cusick with the mission of providing “creative space for education, exhibition, performance and exchange between the public and the art community.” They have become a substantial part of the local Dallas art community and we can’t wait to work with them. 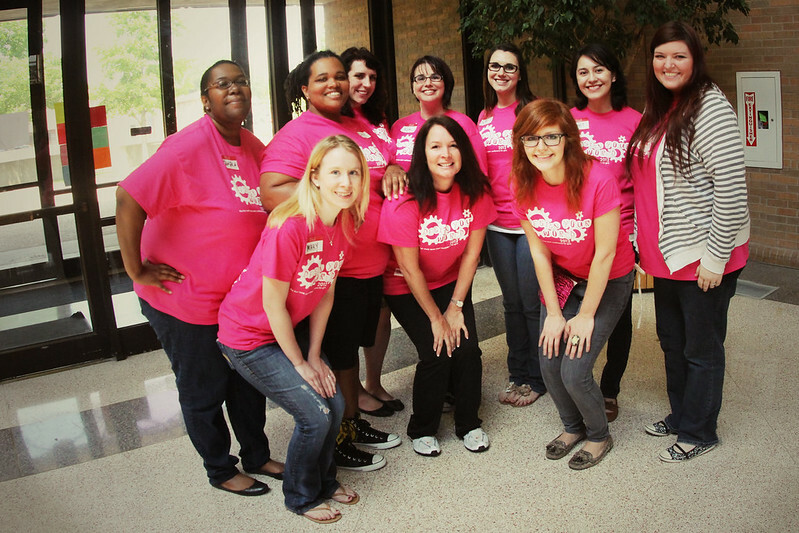 A huge chunk of the Etiquette team will graduate from the Emerging Media & Communications program at UT Dallas today. We want to wish you the best of luck and happy graduation! If you have ever wondered what a mass of 200 excited-about-STEAM fourth and fifth grade girls would look like, you could definitely find this sight at the first ever Design Your World STEM Conference for Girls at the University of Texas at Arlington this Saturday. With support from marquee-level sponsors like Raytheon and ExxonMobil, these girls are in for a day of learning, experimentation and design. Astronaut Anousheh Ansari will speak about being the first female private space explorer and what it was like to conduct research at the International Space Station. Really, this conference has it all: activities, speakers, tours, awards, awesome t-shirts, astronauts! Letia Blanco, the Conference Organizer, is doing an impressive job working with her team on the many elements of the conference. We absolutely cannot wait. We just put in our big order for the LilyPad components for the Design Your World Conference. A big thank you to SparkFun Electronics for helping us out with this. The University of Texas at Dallas EMAC Program will also be lending laptops and usb cables. Yayy! Big thanks to the Mobile Lab tech Sofia (@sichbella) for facilitating. First LilyPad Arduino Workshop - IT HAPPENED! Although we can’t say our first LilyPad Arduino Workshop went off without a hitch; we were able to overcome any obstacles that arose and overall it was pretty dang great. We put out an open call to the ladies of the Fashioning Circuits and anyone else interested to learn the basics of building things with the LilyPad Arduino. It was great to have so many people attend - y’all are AWESOME. An extra big thank you to Dean Terry and the UTD Mobile Lab for letting us use their creative space for the night. Patti suggested “perhaps having step by step instructions for how to download the Arduino program and install the drivers may be helpful if the girls wanted to go home and do this on their own.” This step is crucial if we want to encourage the girls continue crafting projects at home. She also suggested having a cheat-sheet for the volunteers the day of the conference that explains how to connect and code with the various sensors. Empowering the volunteers with the tools and information they need will really help the day go smoothly. If you’re interested in attending our next LilyPad Arduino workshop, email us and we can add you to the list. With a diverse set of fourth and fifth grade girls at the Design Your World Conference, the Etiquette team conducted its first LilyPad Workshop with nothing but success. We spent an hour and a half showing twenty amazing girls how fun prototyping with the LilyPad Arduino is. A few bumps in the road provided for some fun (we had some random technical difficulties) but overall the girls were excited and interested in working with the LilyPad. The etiquette team arrived in full force with ten ladies dedicating a decent chunk their Cinco De Mayo to helping the cause. Our volunteers were able to get the girls so pumped during a brain-storming session that when it came time to share, a raised hand was held by every girl in the room. We want to thank Design Your World for inviting us to participate in the conference; it was a great experience and we learned some valuable lessons. During the session, we reviewed the history and steps for working with the LilyPad Arduino (craft, electronics, and code), asked the girls to think of ideas for sensors, actuators and projects, then gave them time to prototype the ‘blinky’ sketch with alligator clips. After filling out the surveys, the girls played with the take home kits. They figured out that if they put the LED on the battery properly, it would light up. What happened next was pretty amazing. Lauren Von Eper was kind enough to take pictures! Check them out on the Etiquette Creative Facebook page. Thank you. In an informal, large, open space including couches and coffee tables, the teachers avoided lecture-style instruction in favor for more participatory and interactive sharing sessions. The unique element about this experience by this subset of girls was the room for design options. Typically in arts and crafts, they are taught to repeat a newly learned skill. In this case they are able to use what they know to create something they can take home, show off and even offer as a present. 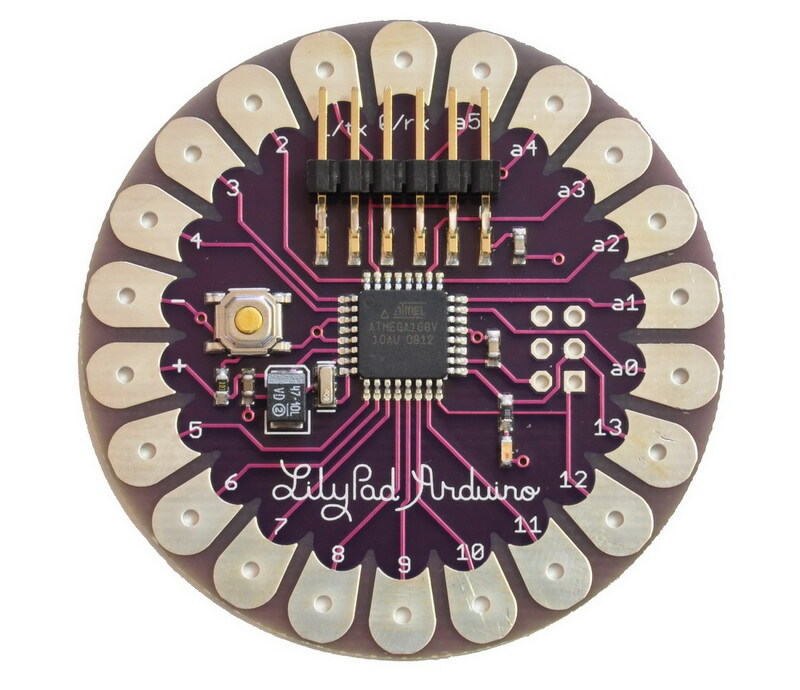 Join Ettiquette for our first LilyPad Arduino Workshop at 7:00pm on April 5th. Students will light up LEDs by learning the basics of sewing, circuit theory and coding with the LilyPad Arduino. Join the women of Fashioning Circuits and other UTD students as we work through the world of LilyPad Arduino. Feel free to invite anyone else who may be interested. This workshop will be held at the UTD Mobile Lab in the ATEC Building. To kick off my research, I am reading Getting Started with Arduino. Massimo Banzi walks us through the Arduino UNO with a description of the platform, inputs and outputs, and example projects to help guide the beginning tinkerer along. Arduino is intended to facilitate prototyping of interactive design. Banzi introduces ‘The Arduino Way’: a methodology of investigation through tinkering. He shows all the best ways to really mess with what an Arduino can do. The book includes methods from hacking toys to making music via circuit bending to show the potential variety of uses the Arduino has. The more prevalent ideology of ‘The Arduino Way’ centers around the strong sense of community and collaboration among its members. One of the key ideas he mentions is “Arduino is not for quitters” and while his reference more directly addresses the way the language is structured, it’s crucial that any experimenter approach working with an Arduino as a learning experience that takes time. Patience and curiosity are key. After detailing Arduino set up and basic coding, he explains all the major components any tinkerer may want to use. There are sensors, software, and actuators - which could be compared to input, code, and output. Digital and analog sensors on the board provide data to the software by evaluating the environment while actuators provide feedback based on the data it is given. The most commonly used actuator would appear to be the LED. He provides a more advanced example that uses a data feed from the cloud to influence colors displayed in a lamp. Seeing the more advanced provides inspiration for more interesting projects, beyond turning an LED on and off. Getting Started with Arduino. 2nd Edition. Sebastapol: Make:Books, an imprint of Maker Media, 2011. 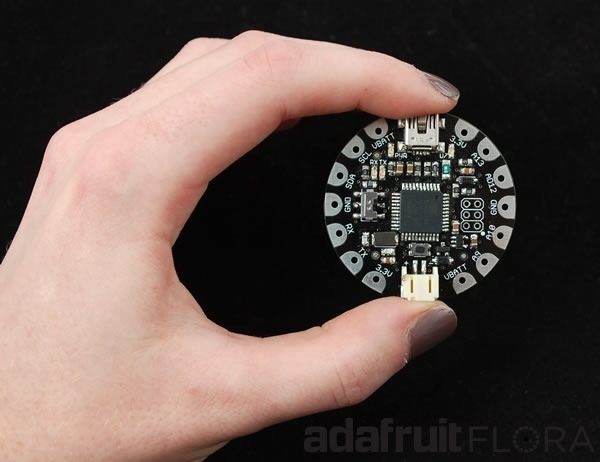 Adafruit and Ladyada recently announced the new wearable microcontroller FLORA. While conceptually similar to Leah Buechley’s LilyPad, its got an entirely new platform. Its got a variety of modules including “Bluetooth, GPS, 3-axis accelerometer, compass module, flex sensor, piezo, IR LED, push button, embroidered + capacitive keypad, OLED and more.” Additional components make it very beginner-friendly. Even better, it’s made right here in America. Hello ladies of the Fashioning Circuits class at UTD - I need your help! I’m working on my capstone this semester and need some woman power. I’m conducting a workshop for girls that teaches how to use the LilyPad Arduino, a micro-controller designed by Leah Buechley at MIT. I plan to research the LilyPad, develop a workshop, plan the event and execute. You can find out more about the background and plan for this project on the etiquette MISSION CONTROL page above. I love the rapid prototyping aspect of the Arduino - I posted a video of some girls working with one and hopefully this can be a bit inspiring. I’m imagining the final workshop being a bit like this, but times 5, or maybe even 10. In your research, I know you’ve seen some of the amazing work with technology that women have done - these girls need to see that too. I need tech-savvy, artistic women like you to help guide the girls through an Arduino based lesson the day of the workshop. Not familiar with the Arduino? In exchange for your help I’d like to host a more grown-up tinker day for those volunteering. This would ideally be a day in which I would offer my ‘expertise’ in answering any sewing, circuiting, or coding questions you may have. This would be somewhat like a mid-term for me and you might just get your Fashioning Circuits textile project done along the way. Last semester, for the first Fashioning Circuits textile project, I followed the LilyPad Wrist Band POV instructable to make a LED wristband that displayed text through a trick of the eye. It turned out pretty cool and was a really satisfying project to make, kind of like the one below. I documented that workshop on the Fashioning Circuits blog and while I’m not sure what kind of projects you have in mind; there are a ton of ideas out there to build off of. The feeling you get when those lights blink for the first time is next to priceless. I’m pretty passionate about this and I hope you’ll consider working with me. Thank you for your time. CRAFT Video: LilyPad Arduino 101 from MAKE magazine. Becky Stern provides a cool video introduction to LilyPad for Craftzine using a basic embroidery hoop, LED, connective thread, LilyPad and power supply. Pay attention to this video, its got some great tips for hand sewing with the LilyPad. Arduino the Cat, Breadboard the Mouse and Cutter the Elephant from hmt on Vimeo. It’s really great to see young girls work with Arduino. During this workshop, they learn about interaction, idea building, concept design, micro-controllers, circuitry, and even get to mess with some code. The questions asked by the conductor help to challenge the girl’s thinking.